These seem to be popular in every health food store I visit. Promising both flavor and fiber, being entirely natural, and still being chewy, delicious and nutritious, it leaves me curious to try! So, i was excited when GNU foods sent me some bars to try. They come in several flavors, Banana Walnut, Espresso Chip, Lemon Ginger, Peanut Butter, Cinnamon Raisin, Orange Cranberry, and Chocolate Brownie. All of them contain 50% of your daily fiber needs (12 grams) and are sweetened with fruit juice, not high fructose corn syrup or refined sugars. They are also dairy free, yeast free and preservative free. I got to try the Banana Walnut, Espresso Chip, Cinnamon Raisin and Chocolate Brownie varieties. Each bar is a decent size, 45 grams, which is a little bit wider but the same length as say, a nutrigrain bar. I liked how the packages were cute. They have a little cartoon bird on it and what i think is a ram? Who knows- both cute!! Banana Walnut– This one was pretty good. It has a banana flavor but it wasn’t that sweet. I did taste a prominent taste of walnuts though, so if you like walnuts- your gonna like this one! Espresso Chip- mmm. coffee and chocolate flavors- whats not to like? Cinnamon Raisin- ok now this one was GOOD. It was soo much softer and moist than the other varieties. It had a nice cinnamon flavor and plump little raisins in it. (*added)Peanut Butter– not bad, but in my opinion, not peanut butter-y. It more had an off taste with like, a sweet raisin flavor and a hint of peanut. Not my favorite. Overall, these are pretty good. If you need the fiber but aren’t too fond of bran cereals or muffins (uh..who is? ), give these a shot. Definetly get the cinnamon raisin one, it rocks! I give these 4 stars overall, for high fiber content, no refined sugars, and a really good oatmeal cookie alternative. Each bar ranges from 130-140 calories, 3-4 grams of fat, about 30 carbohydrates, 12 grams of fiber, and 3-4 grams of protein. 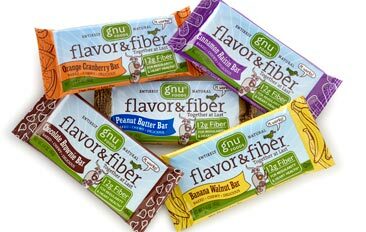 Gnu High Fiber Blend™ (whole rolled oats, organic whole wheat flour, wheat bran, organic kamut, psyllium, flax, millet), chicory root inulin, fruit juices, rice dextrins, apples, canola oil, walnuts, rice, plums, banana, wheat protein isolate, natural flavors, baking powder.